The Staffordshire Bull Terrier Interpretation & Illustration of the Written Breed Standard is used worldwide for judging seminars and has also been converted into several languages to be used around the world. This project was recently used as the text basis and source material for the SBTCA Illustrated Breed Standard project which is now the official one used by the AKC parent club for the breed. Books also available in soft cover, hard cover with dust jacket and immediate downloadable eBook. Contact us for permission to use for seminar presentations. 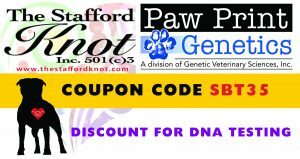 Please do not use any part of TSK without written permission – Please credit The Stafford Knot, Inc. if given permission. We depend upon your tax deductible donations to continue our efforts for this project. Please consider a donation. Thank you. 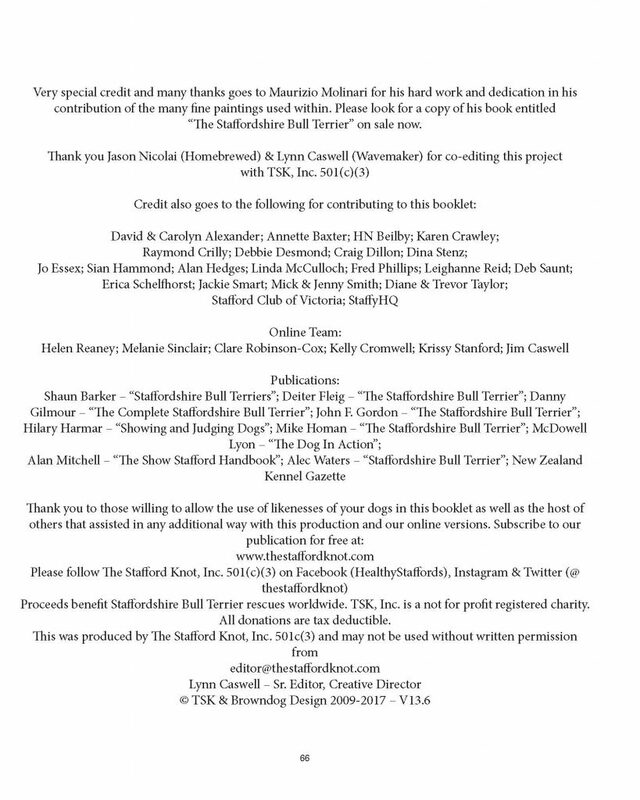 The Stafford Knot, Inc. would like to credit the many people around the world who contributed to this wonderful project in an effort to come together for the betterment of this breed. Thank you to all volunteers, writers, photographers and contributors. PLEASE do not steal our images and work. We are happy to share but ask that you contact us for permission so that we know where it is being used. Credit must be given to TSK when using our work for copyright purposes. A small donation for its use is greatly appreciated as all proceeds go to help Stafford rescues worldwide.